Wireless technology has been evolving every year as we need to accommodate higher demands, speed and security. Many new technologies emerged and succeed in the last decades and it is still moving forward at top gear. Have you ever wondered what would be our future wireless technologies for IoT and 5G networks? Here are the top five wireless technologies that going to be prominent in future together with conventional cellular networks (GSM, CDMA and LTE). Wi-Fi is one of the most familiar wireless data transmission technologies today. Wireless LAN using Wi-Fi technology allows us to connect to local network as well as internet without wired cables. Any information will be converted into digital data packets and transmitted to devices connected to the network. Wi-Fi technology is technically known as IEEE 802.11 standard which continuously evolve and improve to support higher data rate and enhanced security. It operates in two major frequency bands of 2.4GHz and 5GHz. Future Wi-Fi networks would be capable of transmitting data at several gigabytes per second. Wi-Fi technology uses an encrypted data to ensure the system security and follow TCI/IP protocol. A wireless router is used to transmit and receive signals from devices. Wireless router will be connected to an Ethernet cable or fiber optic cable and network configuration can be done using a PC. Application: Mobile devices, medical and smart devices, home and office networking. Wi-Fi is a promising wireless technology due to its flexibility, easy configuration, higher data rate and it is inexpensiveness. Wi-Fi will be playing an important role in 5G technologies like Wi-Fi offloading for mobile networks. Bluetooth is another popular wireless technology used in personal devices, industrial and medical applications. Bluetooth technology was developed by Ericsson; it also uses 2.4 GHz similar to Wi-Fi. Bluetooth is an efficient technology in terms of power requirements and implementation. It is designed to operate in short range transmission which requires very less power to operate (typically in milliwatt). Bluetooth modules are much easier to embed into smart devices thus a perfect choice for wireless headsets and wearable. It is one of the best options for wireless audio streaming devices and smart healthcare systems. Application: mobile devices, medical equipments, smart devices and wearable. 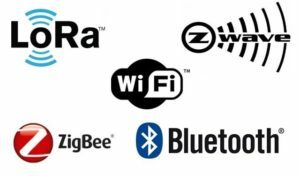 Zigbee is another technology falls under wireless personal area networks standards (WPAN) of IEEE and often used in industrial applications. Like Wi-Fi and Bluetooth, Zigbee also uses 2.4GHz spectrum for communication. It is suitable for application which requires lower data rate and less frequent data transfer. It operates at low power mode and suitable for sensor technology in industrial applications. Zigbee ensures higher security, scalability and efficient data transfer. It is a perfect candidate for future IoT devices. Application: Industrial devices, sensor monitoring and IoT. Low Power Wide Area Network is a wireless communication technology mainly designed for Internet of Things applications. This technology will be used to connect between devices using a centralized server unit. Encrypted data will be transmitted via different frequency channels at different data rate. LoRaWAN terminology has end-point devices with many classes according it’s receive mode of operation. It ensures enhanced security at network and application level using several layers of encryption. 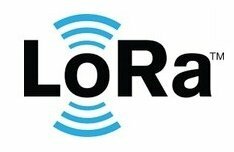 LoRaWAN is a recommended technology for smart cities, smart home and many smart devices for industrial automation and IoT. Application: Industrial automation, IoT, long range irrigation system, security systems and home automation. Z-wave is a low power wireless communication technology specially designed for home automation. It is suitable for automated lighting controls and collect data from sensors wirelessly. 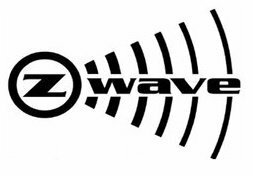 Z-wave uses ISM spectrum below 1 GHz range. Z-wave is known as one of the simplest system due to its less complicated network protocol. It is designed to operate at lower data rates compared to Wi-Fi technology. Application: Home automation and sensor technology. Technology evolution like 5G and IoT opens endless opportunities for many technologies to satisfy wide variety of requirements. According to predictions, our wireless technology must be capable to support billions of devices with minimum latency and enhanced security in the near future. A helpful basic article, however the description of range for Bluetooth is completely incorrect. Current use cases include long-range Bluetooth up to 300 meters. Thanks for highlighting Brad. Which bluetooth class you are referring to? Class 1 bluetooth standard has only 100 mW transmit power. Hi Rajiv, Thanks for the reply. The reference is to a Class 1 router connecting to any Bluetooth device. I understand this is a paradigm shift. In this case, range extension is not based on transmission power (nor a mesh topology), but rather patents on antenna design and filtering capability. https://www.cassianetworks.com/blog/long-range-bluetooth-iot-edge-router/ NOTE: The 1,000 range is based on a Bluetooth 4.2 or earlier standard. The expectation (currently in testing) is Bluetooth 5.0-enabled Cassia gateway (E1000) to Bluetooth 5.0 device will be 2x-3x the 1,000 foot range.